When I am writing, I like to either be in total silence, or random music on in the background. My tastes vary and are unpredictable. I asked author T. Michelle Nelson what kind of playlist she had while working on her latest book The Life and Death of Lily Drake. I’ve had so many people ask what music I listen to when I write. Many authors these days are putting playlists up on their websites of songs that served as inspiration as they worked on their novels. I suppose I may be a bit weird, but I despise any noise while I’m working. I’ve always hated any sound while I try to concentrate it makes me completely insane. That being said, music does often serve as inspiration to me when I’m not actually typing on a manuscript. A song might be playing in the car and I will immediately envision a character doing a certain action. Maybe it’s a slow song and characters are dancing or falling in love. For Life and Death of Lily Drake, there was plenty of music that inspired me. I listened to a ton of Otis Redding and Etta James during that time. Also some Nina Simone. But not all of my book playlist music was oldies, I happen to love some Foo Fighters. I find Dave Grohl’s lyrics to be incredibly inspiring. If you’ve read my novel, you know the main character Lily is a bit of an 80’s hair band fan, so during many of her shenanigans I picture some Motley Crue, Guns n Roses or KISS playing in the background. I won’t deny it, I’m a hair band girl too. Dating them is the hard part. 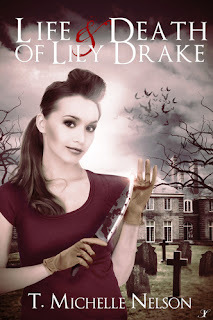 Lily Drake is your everyday hard-working single mom…until a gorgeous vampire shows up on her front door who she mistakenly assumes is her blind date for the evening. As one crazy scenario after another unfolds, Lily finds herself falling in love with two vampires, slaying the evil ones, and being prophesied as the savior of the entire undead race. Deciding between pizza and Chinese take-out will no longer be one of the hard decisions facing Lily Drake once she is immersed into vampire society. Humanity or immortality? That doesn't hold a candle against this question - which of the two handsome vampire cousins? The Life and Death of Lily Drake is not your typical vampire love story. It’s a tale about the humorous mistakes a woman makes simply trying to survive not only life, but the dating scene. How will Lily manage working full-time, taking care of her young son and fighting the undead at every turn? Lily will have to figure it out, but who better to save the world than a mom? Buy the book now at Inkspell Publishing Store and enjoy a special EXCLUSIVE 30% discount! Offer valid only till 30th Oct! Also, available at Amazon, Barnes & Noble, and The Book Depository amongst others. I loved this book! Did you read it? What did you think? I haven't read it so far but it sounds interesting. I haven't read it so far, but it sounds interesting. 'The Shamanic Detective' Book Tour Blast! 'Resisting Velocity' Release Day Blitz! 'Unguarded' Book Tour Blast! Win books and GCs! 'Taming the Wolf' Book Blast! - Win a Kindle! 'The Silver Cross' Book Tour Kickoff! 'Maui Widow Waltz' Book Blast! 'Deliver Us' Release Day Party! 'Once Upon a Midnight Dreary' Book Blast! It's the Release Day Event for 'Violet Midnight'! 'The Wedding Wager' Book Blast! 'The Bridge Club' Book Blast! 'Whisper of a Witch' Book Blurb Blitz!